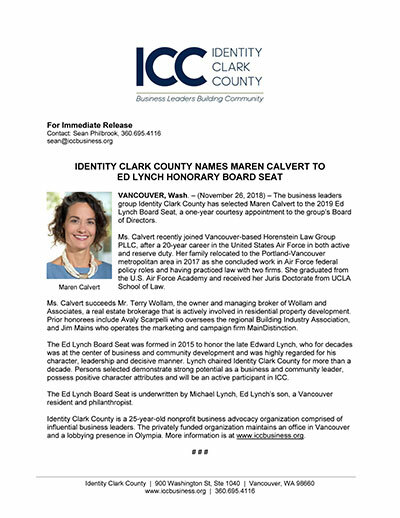 The business leaders group Identity Clark County has selected Maren Calvert to the 2019 Ed Lynch Board Seat, a one-year courtesy appointment to the group’s Board of Directors. Ms. Calvert succeeds Mr. Terry Wollam, the owner and managing broker of Wollam and Associates, a real estate brokerage that is actively involved in residential property development. Prior honorees include Avaly Scarpelli who oversees the regional Building Industry Association, and Jim Mains who operates the marketing and campaign firm MainDistinction.